Breeding mealworms is one of the most popular topics on Youtube and there must be a thousand videos about this subject. Unfortunately, most of them aren’t much help if you are in any way serious about breeding lots and lots of mealworms. About a year and a half ago I started out with three containers, a bedding of oatmeal and carrots for a water source, just like they told me on Youtube. 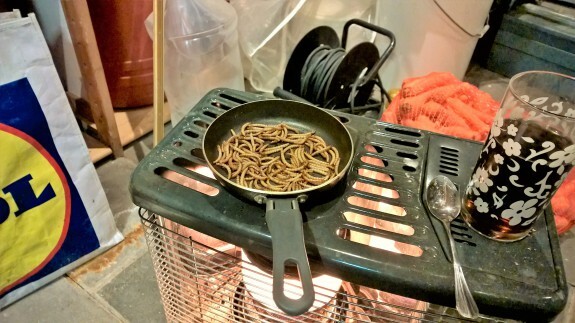 This worked out ok, but I only produced a couple of ounces of mealworms every week and they were all different sizes. It took me about half an hour every day to take care of them. Too much work for too little pay, I thought. That’s when I decided to do some serious experimenting. 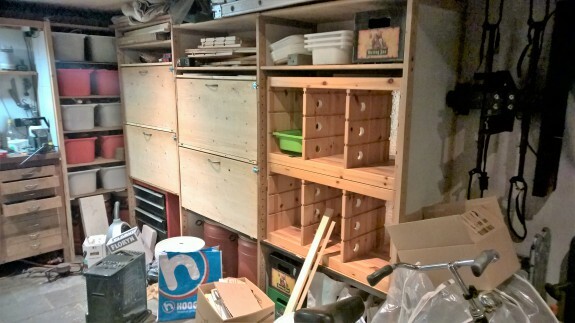 I bought four Trofast storage combinations at Ikea with 36 containers. I made temperature controlled rooms out of them and I started three cycles of mealworms to experiment with. This way I could easily see the different results between the different cycles of mealworms. I experimented with things like bedding, temperature, food, moisture etc. and this paid off very well. With just one cycle, I could now easily produce 2 pounds of mealworms every week. This is over four times as much as I could with my first setup. Before we talk about mealworm food, I’d like to share two things with you. I found that the most important factor for success is their housing. The only way I could achieve this was to use a lot of containers. I sift out the eggs from the beetles weekly so I need one new container per cycle every week. Considering they need about 9-10 weeks to be full grown, that’s a lot of containers. The second important thing is temperature. Their frass (droppings) seems to really attract heat and if the containers get too hot, lots of mealworms will die. So sifting often is very important. If the temperature is too low, they just won’t grow. I keep them between 77 to 86 degrees (25-30 C). After reading a lot about mealworms I found that in their natural environment they live in rotting wood. They can digest the cellulose in the wood but their main source of food would be the microorganisms living in it. In the past I had some experience with sourdough for baking bread and I knew there are lots of microorganisms in it. So I came up with the idea of mixing sourdough with my mealworm food. A crazy idea, but I was stunned by the results. With my ordinary food it took them up to 14 weeks to become full grown. While with this new food, it only took them about 9 weeks. On the internet you can read a lot of romantic, even mystical stories about sourdough. I would definitely advise you to read some of that stuff. There’s really not much to it though. You’ll need a jar and a warm place to keep it. First you make your starter with the same amounts in weight of flour and water (for example 3 ounces or 100 grams) and a little wheat bran and stir it well (see below for a specific recipe). 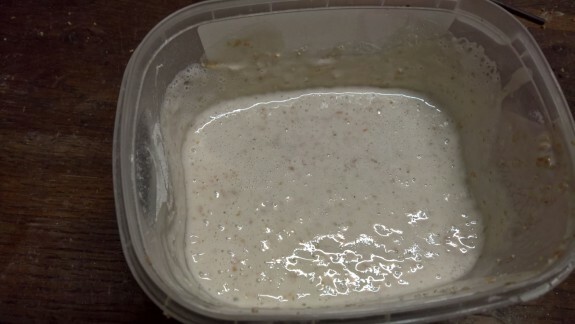 Every day you remove half of the mixture to use for food and add to the original container the same amount of water and flour (no wheat bran). Within a week, you’ll have a nice bubbly substance you can use to bake bread with, or in our case feed mealworms with. Sourdough has a very specific smell and the mealworms love it. 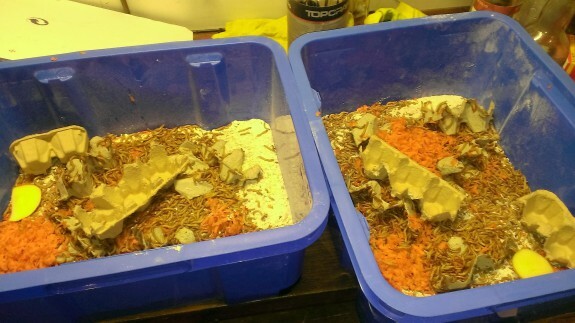 When I start feeding in one container, the worms in the other containers come to the surface very quickly because of the smell. The only problem with sourdough is that the flour in it gets really hard when it dries. If I feed the mealworms too much, they get stuck in the hardening flour and some of them will die. Because cutting carrots daily was a pain, I started looking for a replacement for them. Carrots are really only needed as a water source. The worms can easily survive on bread and water. So I replaced the carrots with other stuff that would absorb a lot of water. I tried saw dust, wet paper, soaked horse food, soaked wheat bran and sugar beet pulp. I even tried water crystals but since humans could one day eat the mealworms ourselves (an ongoing conversation in Europe), I’m a bit concerned about feeding them the chemicals they use in a baby’s diaper. All of these water absorbing things seemed to work to some extent but most of them would dry and lump up with the sourdough, making it almost impossible to sift the worms. This is why I’m picky about what they eat: we could be eating them one day. Then I came up with an idea: I would no longer use flour. I would use a base of soaked wheat bran as a water source and breed the microorganisms in it. To get them continuously growing I would replace half of my food every day, like I would with sourdough. After experimenting for a couple of weeks with different ingredients I finally noticed the alcohol-like smell I was looking for. There’s a bit of a rotting smell too, which I’m still trying to get rid of. The mealworms don’t seem to mind though. I call this my “sour mash wheat bran” after an old hobby I used to have: making sour mash moonshine. 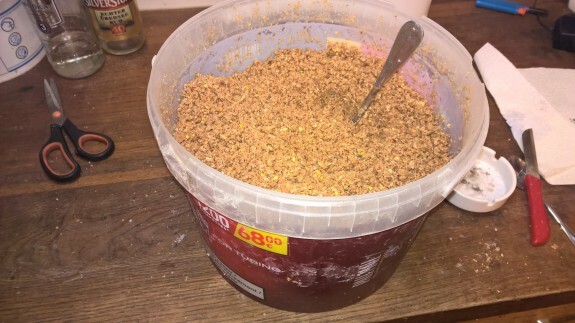 Here’s my recipe: In a bucket you add 6 cups (1.5 liters) of lukewarm water, 3 table spoons of dextrose, a few hands full of fine chick’s food and while stirring, you add as much wheat bran as it takes to get the mixture so dry it’ll really fall apart in your hands. Keep it overnight at room temperature or preferably a little higher. Every day you feed about half of the mixture to the mealworms and add the above ingredients to the remaining mixture again to make more food. Just be sure to dissolve the sugar in the warm water before adding it, or the yeasts will die and you’ll have to start over. After a couple of days you’ll clearly smell the produced alcohol. That’s when you know the process is really going on. I would say the worms like the real sourdough better so I’m certainly not done experimenting yet. Maybe some of you will continue where I left off and share your experience. Why I am picky about their food: we could be eating them! Arjan van der Meer has worked as a system administrator in the automotive industry for many years and sometimes he feels there’s something missing in his job because he doesn’t create a physical product. When he read about the benefits of eating insects and that more and more people will eat them in the near future, he decided to start breeding insects and studying their behaviour. He did this with the intention of maybe starting his own insect farm one day. 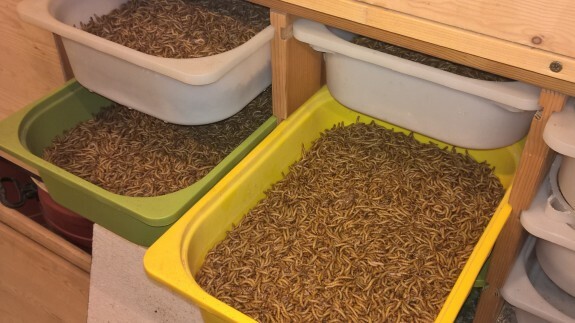 He has been studying mealworms, buffalo worms, sun beetle larvae and crickets for over a year now and he’ll start up a small business breeding mealworms and buffalo worms soon. We gut load insects before feeding them to the geckos to make them more nutritious. Would feeding sourdough to the mealworms end up affecting the geckos in any way? I can only talk from my experience. I noticed that the mealworms love the smell of the sourdough, they get really lively they grow very fast when they eat it. So I would say it’s healthy for them and the healthier the worms are, the better feeders they make. On the other hand: I love the smell of chocolate, I get very lively and grow very fast when I eat a lot of it. So no scientific proof here. A quick search on the internet for sourdough and health, only shows me lots of articles claiming sourdough is very healthy. I didn’t read one negative story. Because people have been eating sourdough for thousands of years, I would say there’s certainly nothing to worry about. If you would still need to gut load your insects before feeding, I don’t know because I have no idea what vitamins and minerals gecko’s need in their food. Healthy food isn’t necessarily complete. If there’s a need to add, say calcium to the food, feeding your feeders sourdough, won’t change that, I’d say. Hello. I have been trying to contact Gecko Time with no success. I would really love to write articles for you guys. Please contact me at my email soon to get me started. Awesome, I’ll have to try this. After reading over this article once again, I thought something was missing, so I’d like to add something. In the article I state we might be eating mealworms in the near future. Well that near future isn’t all that far away for some of us. Whomever has been to Bangkok will know that many people are already eating insects and they don’t think that’s strange at all. In fact, I know a few people that ate insects when they were in Bangkok and they thought they tasted really good. Breeding insects for human consumption is the sole reason I started breeding mealworms. I don’t have any geckos or other animals to feed mealworms. Of course I was the first one to eat my own worms. This felt a little strange at first but after I tried a few, I found out they taste quite good. If you fry them a bit in a little olive oil they get nice and crispy. I’d describe the taste as somewhere between cashew nuts and pine nuts which makes them great to use in a salad. My son and I eat mealworms on a regular basis but so far, I haven’t been able to find any customers who buy them for human consumption. I’m quite sure though, that one day I will. Thanks for your comment, Arjan. It will be interesting to see if we get any “feedback” about this. This is very educational. I am definitely going to try this. Hi Arjan, I’m an Entomologist and know quite a bit about mealworms! I keep them as a clean up crew in my hissing roach enclosures. In the past I had some trouble with the mealworms turning cannibalistic. Especially the beetles against the pupae and the mealworms against the freshly changed beetles. The beetles would eat the brains out of the pupae and the mealworms would eat the wings from the beetles. In rare cases the mealworms even ate each other but I didn’t see a lot of that. At first I thought they turned cannibalistic because they had a shortage of protein but feeding them dog food and fish food didn’t change that. After experimenting a bit, I found out that that the simplest and most obvious way to prevent cannibalism is to separate the mealworms, the pupae and the beetles. Next to that I saw they only ate each other if they had a shortage of water, especially with the beetles. When the beetles have just changed, they’re very thirsty and if they don’t have a source of water, the first thing they will do, is eat the pupae’s brains out. If there’s enough moisture, they’ll leave them in peace. I’m not saying adding some dogfood is a bad idea but I really think there should be enough protein in the chicks food (about 22%) and I think there’s a lot of protein in the microbes in the sourdough. I’m not sure about that though, because there’s no label on it.